Use this time to explain to the patient that you want to work together to relieve pain. Help them understand that in order to make sure the steps taken to manage the pain are effective, you will need to assess pain on a regular basis. The best way to know about someone’s pain is for them to tell you, so invite them to collaborate with you. 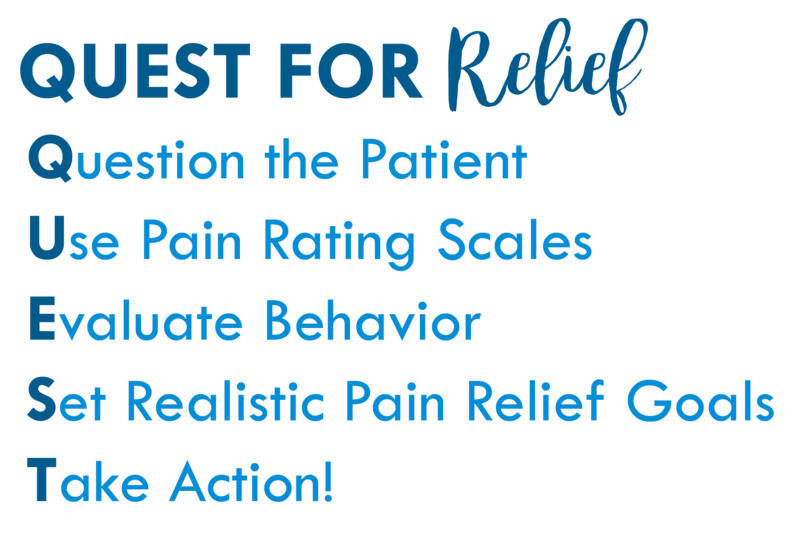 Introduce the pain rating scales that you are using and give people a choice, if possible. You might explain that some people prefer numbers 0-10 and some people prefer the FACES Scale. Use whatever works best for them to be able to communicate about their pain in a way that can be measured to manage the pain. Pay attention and be curious. The behavior is not always what we expect. If you think a person is supposed to be moaning in the fetal position, then when you see a person laughing and talking to a visitor or chatting on the phone, you may be less likely to believe the person is having the pain they are reporting. That is not a safe assumption. Ask family members or friends what they notice. When not in pain, the person may be active and animated, but is now quiet, withdrawn, having a flat affect. Or a person that is usually quiet, now so active they may need restraint. Those situations in which they are doing the opposite of their normal behavior may be an indicator of pain. Encourage family and friends to participate in care to the extent they are able, for instance, they could help with pain assessment, recognize the patient’s needs, or provide welcome diversion. Also, consider the diagnosis or injury. If they have severe pancreatitis, broken bone, or a severe burn, for instance, you can be pretty sure they are having pain. Some causes of pain are not so obvious, but that doesn’t mean the pain doesn’t exist. Just because there is a zero on the scale, it doesn’t mean that pain can always be eliminated. 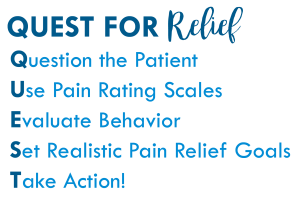 Based on the health challenge and the tools to relieve the pain, talk with the patient and agree on reasonable expectations for pain management. You may agree that a 4 out of 10 is realistic and that can be your mutual goal. Help the family understand the goal, as well. Make every effort to meet the mutually agreed upon goals for pain relief. This could be medication, but also explore other non-pharmacologic approaches to offer relief. Sometimes something as simple as a position change will make a difference. What helps them cope with pain or discomfort? TV? Music? Quiet? Company? Isolation? Light? Dark? Essential Oils? Encourage them to create an environment that will support them in this process. You may also be interested in the Wong-Baker FACES® Pain Relief Log. Find out more about creating a healing environment here: Atraumatic Care.